Raith Rovers manager Ray McKinnon is hoping competition for places can drive his side towards the promotion play-offs. McKinnon’s selections have been limited at times in a season littered with injuries and suspensions, but with key players returning to the fold he is looking forward to having options at his disposal ahead of the final stretch in the race for fourth place. “We’re looking good in terms of numbers in strength and let’s hope it works to our benefit,” McKinnon told the Press. “There’s competition for places in all positions so players need to keep their performance levels up to warrant a place in the team, and to be fair, they’ve done it up til now. “It shows how well the boys have done that we’ve got through a tough spell and we’re still fourth in the league. “We got a good result on Saturday which gives us a springboard, and if we can back it up on Saturday against Morton that will be brilliant. “We’ve got a run of big games coming up that will probably determine where we finish up at the end of the season. “We’ve done well to be where we are, and if we can keep every fit, and keep pushing, then there’s no reason why we can’t have a bash of getting into fourth. David Bates and Lewis Toshney return from suspension for Saturday’s visit of Morton, although Kyle Benedictus serves the second of his three game ban. The match has the makings of a proverbial six-pointer as a Raith victory would move them seven points ahead of the Greenock side, while an away win would close the gap to just a point. “Morton are a good unit and if we’re not at our best we won’t take anything out the game,” McKinnon stressed. Craig Barr made his first appearance of the season in the 2-0 win over Livingston on Saturday, and McKinnon faces a decision over whether to keep faith with the back four that kept a clean sheet or recall Lewis Toshney. “Mango did well but he’s not match fit, whereas Tosher is match fit,” he said. Louis Longridge has missed training for the past week due to a knee strain, but Lewis Vaughan, out injured since damaging knee ligaments in August, took part in a training session for the first time on Tuesday. “He’s still a wee bit away but it’s good he’s back in the fold,” McKinnon said. Rovers are quickly back in action after the Morton match with a trip to Ibrox to face league leaders Rangers on Tuesday. McKinnon added: “I’m thinking of changing it up a wee bit and doing something different because nobody expects anyone to go to Ibrox and get a result. Rovers have been handed a huge boost for next season with the news that captain Jason Thomson and stalwart Iain Davidson have agreed new contracts. McKinnon has also lined up a wide-left midfielder on a pre-contract agreement. One player set to leave Stark’s Park is youth prospect Sean Mackie, who is wanted by Hearts and Hibs. Both Edinburgh clubs have expressed an interest in the 17-year-old left back who has played just one minute of first team football since joining Raith in the summer. After impressing in development league games, Mackie was invited to train with Hearts last week and was subsequently offered a deal for a minimum of three years. He has since held talks with Hibs officials, including head coach Alan Stubbs, and is understood to have been offered a four-year contract to sign on at Easter Road. 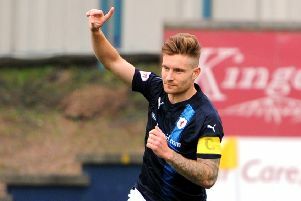 His Raith contract expires in June 2017, meaning the Kirkcaldy club will be due a fee from whichever club wins the fight for his signature, with the club believed to have set a valuation in the region of £75,000. Mackie made his only senior appearance for Raith at the age of 16 last August, when he played as an 89th minute substitute against Alloa in the Championship. He joined up at Stark’s Park two months previously on his first professional contract, becoming the first youngster to graduate to Raith from the Fife Elite Football Academy. He is regarded as an athletic full-back with good defensive qualities and a cultured left foot, who has the potential to play at the highest level. McKinnon said: “He’s an outstanding young kid and is full of potential.